DEAL EXPIRED: Today only, B&H Photo is slashing the price of Apple's 32GB 9.7-inch iPad Pro (Wi-Fi + Cellular) by $200, bringing it down to $529.95 with free expedited shipping. 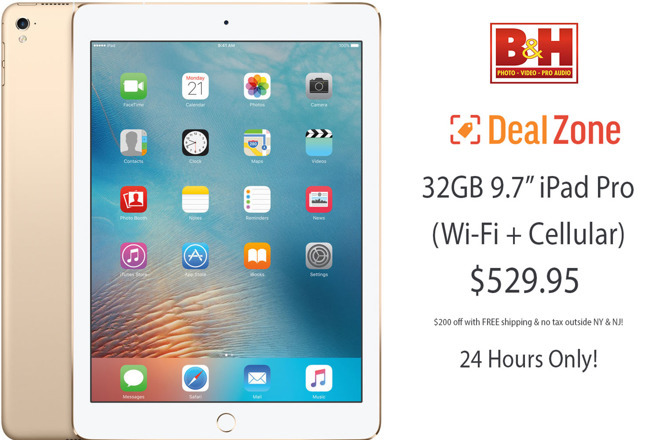 This iPad DealZone event is valid for one day only and expires at 11:59 p.m. Eastern on May 9. In addition to the limited time markdown, B&H will not collect sales tax on orders shipped outside NY and NJ, making this iPad Pro (model MLPY2LL/A) over $250 cheaper for many shoppers compared to paying full price with tax at the Apple Store. According to our 9.7-inch iPad Pro Price Guide, this deal offers shoppers the lowest price available from an authorized reseller by $170.